3D Dress With White Flats ! Be it a movie or a dress, everyone wants to be a part of 3D world. This thought has given us an idea and we have come up with a 3D dress which will make your girl look very cute and adorable. Go green is something everyone is talking about, so why not implement it on your kids outfit as well. Therefore, we have created a combination of gorgeous 3D dress and white flats, check it out. Greenery with 3D effect makes this dress an exclusive one for your kids. 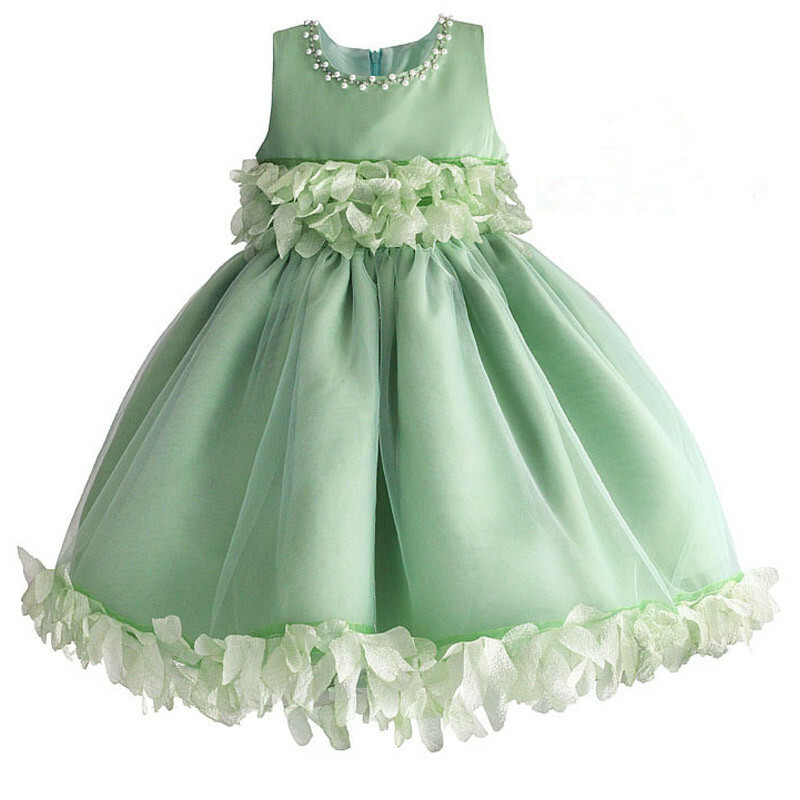 Greeny Love 3D Flower Kids Dress, it has gorgeous flower appliques on waistline and hemline is what makes this dress beautiful. The embellishments on neckline enhances the grace. The best part is the green color of the dress is not too bright, it’s a subtle one, because of the color this dress will look perfect both in day party and night as well. The back zip closure is providing perfect fit. It also going to give you lining just to make the dress look more balanced. It’s a perfect party dress for baby girl and will make her look very pretty. If your girl is a fashionista she is going to love it for sure. Now comes the footwear which will match with the dress and enhance the grace of the dress. Cujos Calpe Casual Cool Fashion Sandal is the perfect footwear, it has white subtle color with buckle closure to give your girl a comfortable fit. If you look closely, the sole of the sandal has design and it is of very good quality which will give stability in the footwear. It’s a very comfortable fit and we all know that white color footwear will going to match with any other color dress. So grab it now! This is one of the sophisticated combination you are going to find out in babycouture website but we have more dresses and footwear which you can make combination of and style your girl like a diva.From shoes to dress top gowns to headbands and many more. There is something for every kid, so why not explore and grab the best one for them. This is the best time to shop summer attires, as you can get the best at most reasonable prices. So don’t wait more and buy now! The post 3D Dress With White Flats ! appeared first on Baby Couture India.